I went up the mountain last month with a group of friends. We reached King George’s Peak on the Eastern Plateau of Kinabalu. The trail up there was the same as Summit Trail up until Panar Laban Rockface, where we then diverted to the right side of the trail into the woods. From there on, the climb took another 5 hours to the peak. These are 10 less exposed photos of the mountain, seen from the other side of the plateau. You won’t see this photos when you climb up to Low’s Peak. Western Plateau of Mount Kinabalu seen from King George’s Peak, Eastern Plateau. From left, Phallus Peak, King Edward’s Peak, Eastern Ridge, Tunku Abdul Rahman’s Peak, Donkeys Ear’s Peak, Low’s Peak and Victoria Peak. King George’s Peak. From the point I took this photo, it took me another hour to reach the peak. I was walking on the plateau almost two hours to reach the peak. Try spotting a climber on the photo. Phallus Peak (left) and King Edward’s Peak. King Edward’s Peak is a technical climb. You need to don safety gears and skills of rock climbing to reach it. Very few people have reached the peak. Western Plateau of Mount Kinabalu and Low’s Gully seen from King George’s Peak. The gully separates Kinabalu into two ridges – east and west. Because of the danger, not many people were allowed to go into the gully. Until now, it remains a mystery. We are on King George’s Peak, with Western Plateau on the background. The left cairn marks the highest point of the peak. It was documented as 4062m asl, but my GPS watch showed 4072m asl. View from King George’s Peak, facing south east. From left, Red Rocks, Mesilau Pinnacle, Phallus Peak and King Edward’s Peak. There are few plans to build a hut similar like Gurkha Hut near Red Rocks, for those who would love to explore this side of the mountain. Of course, the guide and permit will be totally different from the Summit Trail. At the ledge of Eastern Plateau with Mesilau Gorge at the back. From this point, you can see clearly Kundasang & Ranau far behind us. And yes, we are above the clouds. At the ledge of Eastern Plateau, with Kinabalu South Peak at the far right. 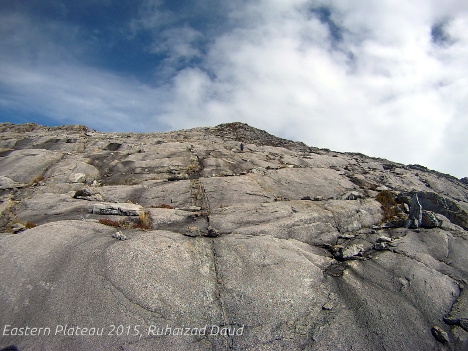 In clear morning, you can see climbers coming down the Summit Trail below Kinabalu South Peak. Vertical climb of 90 degrees using rope and ladder. Safety harness is a must when you follow the trail to the Eastern Plateau of Mount Kinabalu. There are 4 stretches of vertical aluminium ladder that were fixed by the Sabah Parks for climbers to the plateau, at the early part of the climb. We need to wear harness for safety purposes, as it was a vertical drop of nearly 1000 meters to Mesilau Gorge. These rope, ladder and a ‘chimney’ makes Via Ferrata of Kinabalu really pale. When we came down from King George’s Peak, it was noon. The clouds started to come and covered the plateau and the trail. As there were no ropes on the plateau, we need to stay close together and follow our guides and cairns. Oh, the clouds brought rains. That makes the route even more dangerous and slippery. I have helped thousands of climbers of Mount Kinabalu to book their climbing spot since 2006. If you want me to help you, just fill in the form below and send it to me. Thank you very much!